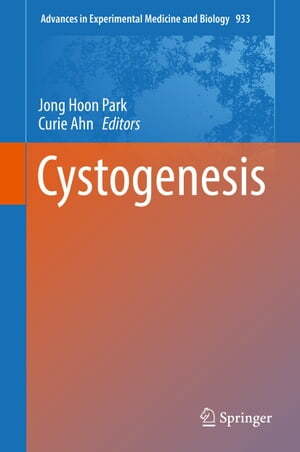 Collins Booksellers - Cystogenesis by Jong Hoon Park & Curie Ahn, 9789811020414. Buy this book online. Autosomal Dominant Polycystic Kidney Disease (ADPKD) is a highly prevalent hereditary renal disorder in which fluid-filled cysts are appeared in both kidneys. Main causative genes of ADPKD are PKD1 and PKD2, encoding for polycystin-1 (PC1) and polycystin-2 (PC2) respectively. Those proteins are localized on primary cilia and function as mechanosensor in response to the fluid flow, translating mechanistic stimuli into calcium signaling. With mutations either of PKD1 or PKD2, hyper-activated renal tubular epithelial cell proliferation is observed, followed by disrupted calcium homeostasis and aberrant intracellular cyclic AMP (cAMP) accumulation. Increased cell proliferation with fluid secretion leads to the development of thousands of epithelial-lined, fluid-filled cysts in kidneys. It is also accompanied by interstitial inflammation, fibrosis, and finally reaching end-stage renal disease (ESRD). In human ADPKD, the age at which renal failure typically occurs is later in life, however no specific targeted medications are available to cure ADPKD. Recently, potential therapeutic targets or surrogate diagnostic biomarkers for ADPKD are proposed with the advances in the understanding of ADPKD pathogenesis, and some of them were attempted for clinical trials. Herein, we will summarize genetic and epi-genetic molecular mechanisms in ADPKD progression, and overview the currently available biomarkers or potential therapeutic reagents suggested.